Tapawingo National Golf Club – God designed the first 6 holes. Welcome to Tapawingo National Golf Club! Welcome to Tapawingo National Golf Club where rivers, lakes and hardwood forests provide the ultimate golf experience for players of all skill levels. Tapawingo's 27 holes were designed by World Golf Hall of Famer, Gary Player. Mr. Player won 9 major Golf championships in his career; and is one of 5 men to win professional golf's Grand Slam. The Boccardi family took over ownership of Tapawingo in 2013. They recognize the need for Tapawingo to be one of the finest golf facilities in the St. Louis region. Moreover, Joe Boccardi's restaurant at Tapawingo offers food and beverage services for golfers & customers alike. Come for the challenge, Stay for the experience! The Next Step Golf Academy is headquartered here at Tapawingo National Golf Club. Our goal is stated within our name: helping juniors advance in the game of Golf. 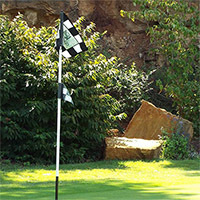 Whatever your junior's ability is, our teaching staff will provide excellent instruction and incentive to each golfer. Most importantly, boys and girls will have fun at our camps & clinics!